Tim McAlpine has presented at more than 100 credit union and finance conferences in Canada, the United States, Mexico and Jamaica for many top organizations, including Forrester Research, CUNA, CUES and the Caribbean Confederation of Credit Unions. He is consistently ranked as one of the highest-rated speakers. What Do Young People Want and Need? Tim McAlpine is widely recognized as one of the world’s foremost authorities on young adult strategies for credit unions and he is also a popular speaker on the credit union conference circuit. 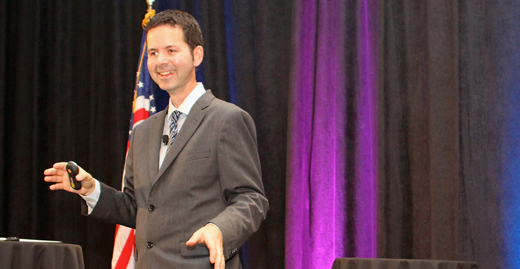 In his dynamic presentations, Tim tackles relevant marketing and financial education topics in a no-nonsense yet entertaining way. He has presented at more than 100 credit union and finance conferences in Canada, the United States, Mexico and Jamaica for many top organizations, including Forrester Research, Credit Union National Association, Credit Union Executives Society and the Caribbean Confederation of Credit Unions. His writing has been published in numerous credit union publications, such as CUES Credit Union Management, The Financial Brand and Credit Union Times. Tim and his company, Currency Marketing, are the recipients of dozens of awards including the Credit Union Central of Canada National Credit Union Innovation Award and 1st place in the Forrester Research Groundswell Awards. Tim is a credit union advocate best known for developing the It’s a Money Thing Financial Education Program and the Young & Free Marketing Program that credit unions from around North America are using to connect with new young adult members. He is also the driving force behind CUES Next Top Credit Union Exec competition and a co-founder of the CU Water Cooler. Tim believes that credit unions and the credit union movement need to work harder to prove that there is a difference and that it matters. Tim McAlpine lives in Chilliwack, British Columbia, Canada. He is the President and Creative Director of Currency Marketing, a digital marketing agency specializing in helping credit unions attract and engage with young adults. Tim McAlpine is the President and Creative Director of Currency Marketing. He is best known for developing the It's a Money Thing Financial Education Program and the Young & Free Marketing Program that credit unions from around North America are using to connect with new young adult members. He is also the driving force behind CUES Next Top Credit Union Exec competition and a co-founder of the CU Water Cooler. Tim has had more than 100 speaking engagements over the past decade. Here's a list of some of the organizations that have hired Tim to speak.